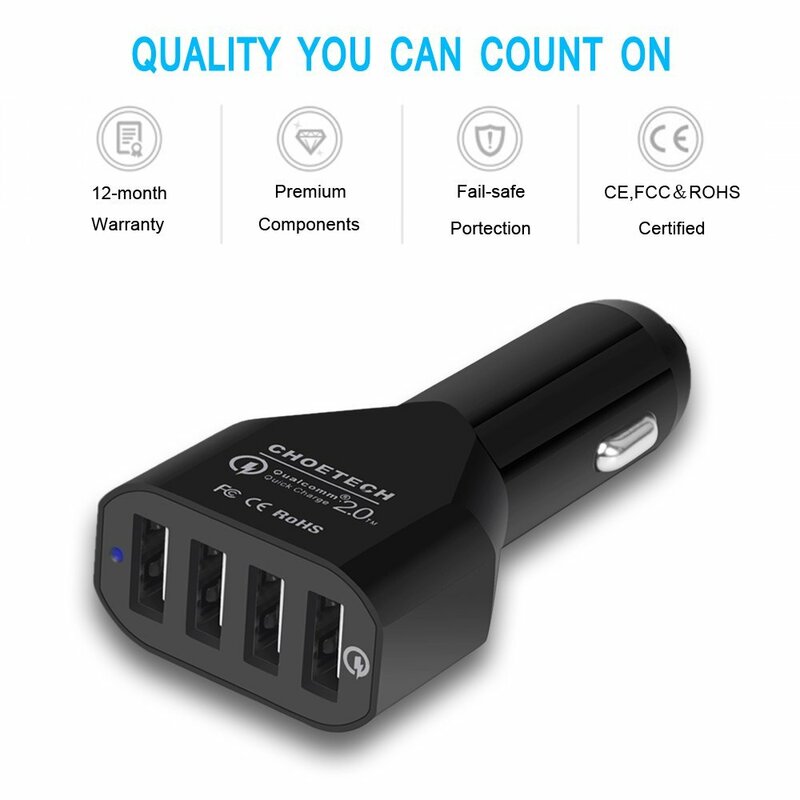 The CHOETECH Multi-port Car Charger is a small, four-port car charger that is absolutely the smallest possible four-port USB charger. Its design keeps it out of your way in the car, but handy for quick charging without fumbling around looking for a charger that might be on the floorboard or under a seat. The charger fits into the power port in your car and can remain there without draining your battery and without having charger wires strung out all over the car like some base unit style chargers do. Everyone in your vehicle can charge a device at the same time and they can be four different devices because of the charger’s auto detect technology. 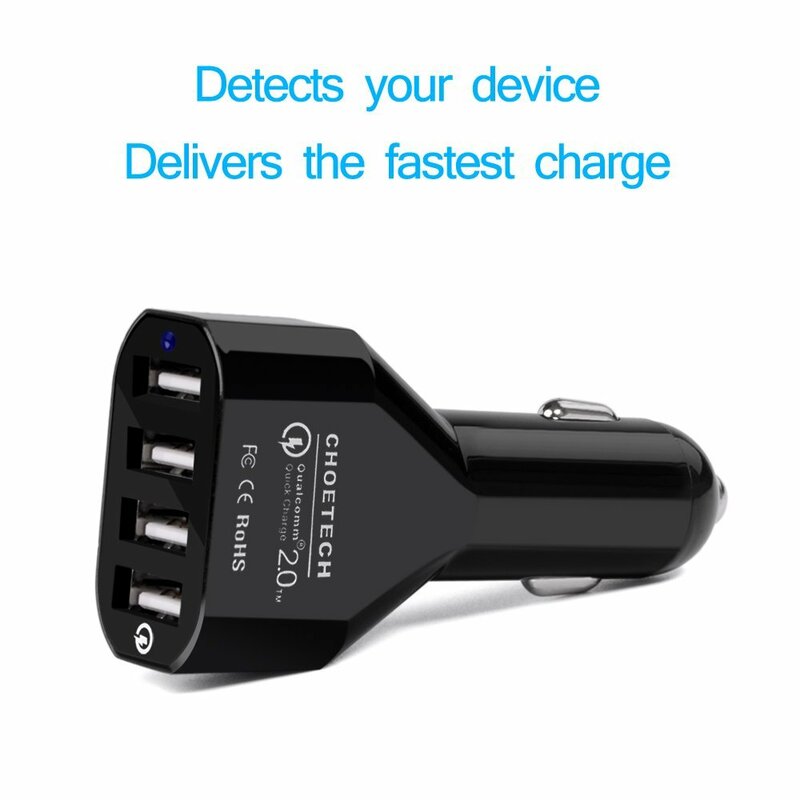 All four USB ports on the car charger have a unique auto-detection feature, which intelligently detects the type of product being charged, (iOS or Android). With auto-detect, each device is charged to its charging specifications. Although there is only one port with Quick Charge 2.0 technology on the charger, the other three ports will still charge your devices faster than ones with typical chargers. 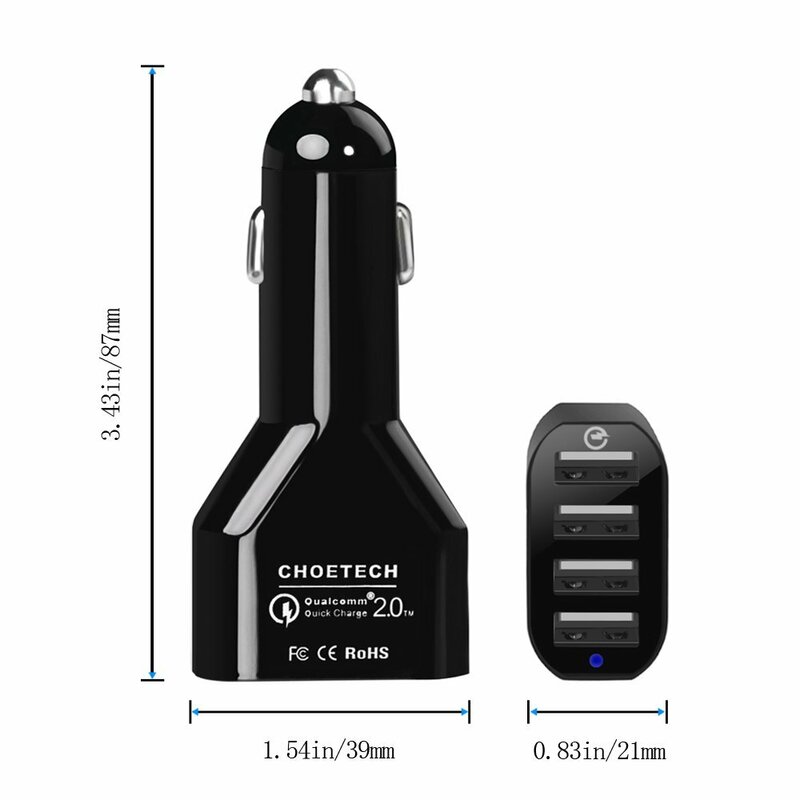 The CHOETECH 4 Port USB Car Charger has a total output of 51 watts and four ports, making this charger a lightweight and easy-to-use solution for anyone on the go. Why it’s Frugal: The CHOETECH Multi-port Car Charger is frugal not only because of its inexpensive price point ($21.99), but also because it serves more than a single device at once. It also auto detects your device’s power requirements and charges it quickly if it has Quick Charge 2.0 technology. A quicker charge means less time wasted waiting on a charge or time spent worrying that your device will fail during an important phone call. Frugal. Only the top USB port is configured for Quick Charge 2.0 technology. If your device doesn’t have Quick Charge technology, then your device will simply charge at the normal rate, which Choe Technology claims is faster than normal charging. I have no reason to doubt the claim, but I also can’t verify it for myself because my average car trip in town is about five minutes each way. Hardly enough time to adequately test the assertion. I will say that I really like the sleek, minimal design because I hate having what looks like a USB hub in my car down in the floorboard getting stepped on and dirty between charges. The CHOETECH charger is in the dash where it should be and conveniently located for everyone in the car. Recommendation: For four USB charging ports in a small device, you can’t go wrong. Buy it.